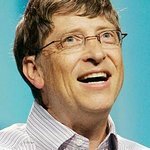 When Bill Gates was looking into what he could do in the world of philanthropy, he says he looked for problems to which governments weren’t already paying attention. That turned out, in the mid-90s, to be global health. Alternatively, one could tackle a highly funded problem from a unique angle. Take education, for example. Gates says that by using technology, he could provide videos of the best teachers to demonstrate their teaching techniques to others. For a fraction of what governments in the US were already spending, it was an effective tool not already being utilized. Unhampered by strings that bind governments, his Bill and Melinda Gates Foundation has also been able to provide seed funding for various ideas, some risky, some that would fail, but some that wouldn’t. Gates feels that technology, which can bring a person across the world into your living room in real time, has helped to foster the interest of young people and he urges them to use their voices, citing Bono's ONE Campaign as a channel to let government representatives know that they support aid.